As many of us know, winter weather sneaks up on us very quickly here in New Jersey. One day you’re enjoying a nice, crisp fall afternoon and the next, you’re bundled up with a hat and a scarf. While you may not be prepared for the cold months to come, make sure that your New Jersey home is! There are many steps that you can take to weatherproof your home. These steps will protect your home from the potential damage that can come with winter weather conditions. First and foremost, you want to keep your home warm. Not only will it benefit the inhabitants of your home, but also your home itself. Inside your walls, where your pipes are hidden, tends to be much colder than the rooms in your home. Your home should be kept at a minimum of 65 degrees to prevent frozen pipes in New Jersey homes. If you still have concerns about your pipes freezing, you can also let your sinks faucet drip a little bit. 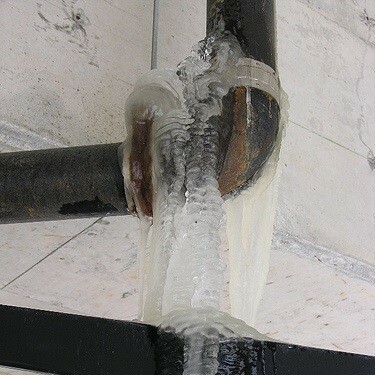 The water moving through the pipe makes it less likely to freeze. This also relieves the pressure from inside the pipe so even if they do freeze, there is less of a chance of your pipe bursting. Keep your gutters clean. Leaves, water, and debris can get caught in there very easily. You will want to clear that out regularly before it gets too cold. This will ensure that nothing that is trapped in there becomes frozen. The weight of frozen debris can damage your roof. When melts, you could be at risk for roof leaks, roof damage and other property damage. It is important that you properly insulate your NJ home. Insulation will not only keep your home warm on the inside, but it will also keep your pipes warmer than if they were not insulated. It can keep them from freezing. However, be careful not to over insulate, this can restrict air flow and limit proper ventilation. It will allow moisture build up and possible mold growth. Check your attic. When a when warm, moist air in your attic comes into contact with the cold surface of your attic sheathing, this can leave you with condensation. Unaddressed condensation in your attic can freeze as the temperatures continue to drop and leave you with a frozen NJ attic. The frost itself won’t do much damage, but as we all know, the ice will eventually melt. This can damage not only the walls of the attic but also your roof. It is also a good idea to check in on your heating systems, such as your air conditioner, fireplace, or furnace. You may want to have them inspected to confirm that everything is in working order before winter arrives. You may suspect that your home may have a draft. Weather stripping is the perfect way to avoid that. 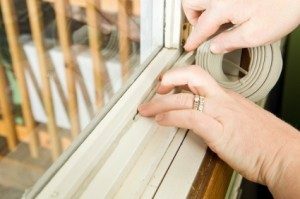 Before winter arrives, make sure you check your windows and doors for any cracks or drafts. Other spots that you should check include your air conditioner, vents, and electrical lines. This weather stripping will help seal the warmth inside, and keep the cold out of your home! Some people may consider their car an extension of their home. Make sure that your car is winterized. Just in case you need to go anywhere, you want to have a full tank of gas, especially if there is a chance of a storm. Even if you won’t be driving anywhere, this helps keep your fuel line from freezing. You should also change your oil, replenish antifreeze, make sure your heating system is in working order, check/replace tires and windshield wipers, and confirm that your car battery is in good condition. You may even want to keep an emergency kit in your car. It is always a good idea to have a winter emergency kit in case of If you find yourself in an emergency situation such as a power outage. Things like space heaters, power generators, blankets, water, and non-perishable food items should be kept with these kits. You may also want to have a flashlight, some cash, and a first aid kit. Rock salt is another key item for the winter, whether you are in an emergency situation or not. Make sure that these items are not hidden in your home and have them readily available in case you should need them. A frozen home is not a happy home. Not only can winter cause many inconvenient circumstances outdoors, but it will also try to sneak its way inside our homes. It can cause damage to your home that will stick around long after winter has passed. Keep the cold out. Using these tips, your home should be safe, warm, and secure from the upcoming winter conditions. Stay safe out there!